Happy Halloween! Tonight I handed out this junk to our twenty or so trick-or-treaters. 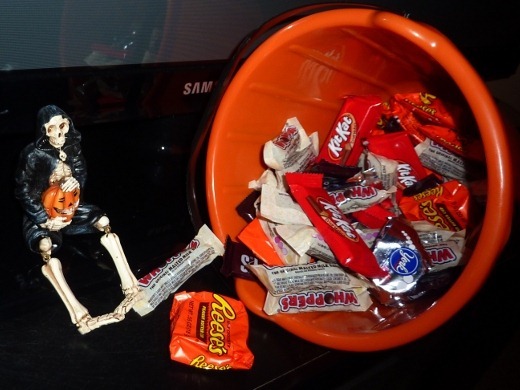 Aww, I love my little skeleton guy. These are actually the leftovers. Must give this away soon so I don’t eat it. I figured that since this is a food blog I should discuss more food in this post. 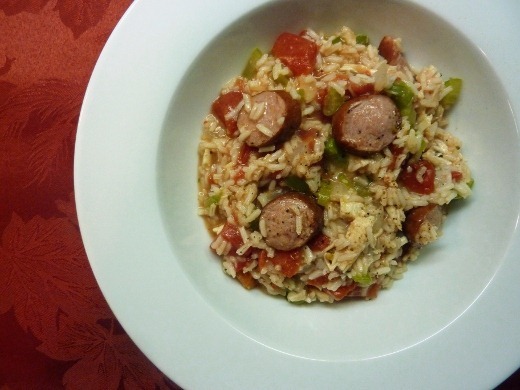 Last night I tried this recipe for Chicken and Sausage Jambalaya from Cooking Light, but it was just okay. 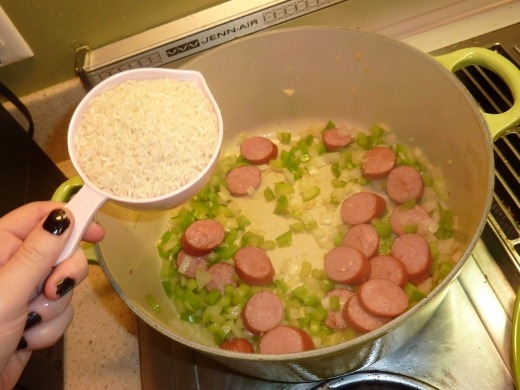 It was pretty bland, so I wouldn’t really recommend the recipe, but it has potential. Yup, still sporting that Black Swan polish. Tonight’s dinner, on the other hand, was somewhat haphazardly thrown together, containing leftover items, since I wasn’t starving after having a potluck at work together. I heated up some leftover turkey sausage, steamed some broccoli, and served it with a scoop of my leftover potluck dish, which was a Tortellini Salad with pepperoni, mozzarella cubes, and artichokes. After dinner, I had to go rescue this bia (in her peacock costume, no less!!! 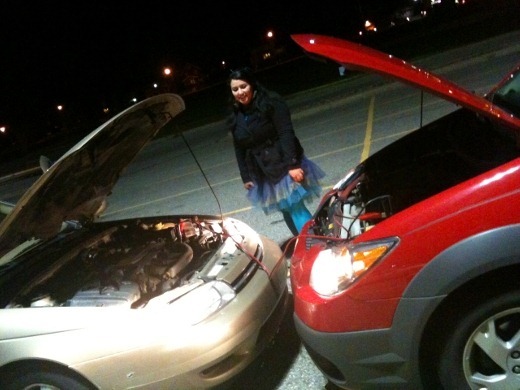 muahahaha) and her dead car. Now I know how to use jumper cables. Five Cent Femme (FCF) had that shiz totally under control, meanwhile I was on the side freaking out, whining that we need a man. I’m so helpless. FCF totally impressed me with her mad car-starting skillz tonight. Especially whilst frolicking in a tulle peacock tutu. Currently listening to: Green Valley – Puscifer. Question of the day: Do you know how to use jumper cables? Am I the only helpless chick out there?